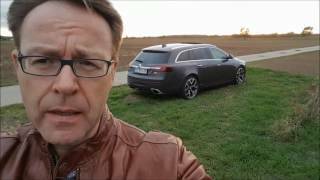 Following last month�s reveal of the 325 hp (242kW) Opel Insignia OPC comes the wagon or �Sports Tourer� version, which is set to go on sale in Opel showrooms in the second half of the year. Like its sedan counterpart, the OPC Sports Tourer comes packing the same twin-turbocharged powerplant, sophisticated AWD chassis and a sub-six second 0-60mph time. For the uninitiated, OPC, which stands for Opel Performance Center, is the name given to models developed by GM�s official in-house tuner in Europe, and in the past has been used for cars like the Astra and compact Corsa hatchbacks. The HiPerStrut system is unique to the OPC model and serves two primary functions: firstly, to reduce torque-steer, but also to maintain negative camber during cornering, thereby improving ultimate grip levels in wet or dry conditions. Drive comes from a 2.8L V6 turbocharged engine rated at 325hp (242kW), which is enough to send the car from 0-60mph in 5.8 seconds and an electronically controlled top speed of 155mph. R�sselsheim/N�rburgring. �The Insignia OPC Sports Tourer will hit dealerships later this year, but first it has to go through hell � the Green Hell of the N�rgurgring's Nordschleife, considered the toughest, most demanding and dangerous race track in the world. 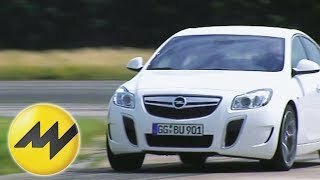 Opel engineers insist that all vehicles in their OPC range complete a rigorous 10,000 kilometer testing around the 20.8�km Nordschleife of the N�rburgring, dubbed the Green Hell by legendary race car driver Jackie Stewart. 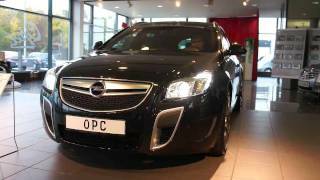 �Just a few days ago, the Insignia OPC sedan finished the challenge with no problems. �The Insignia OPC sedan raced 487 laps for 12 days at some top speeds flawlessly. This kind of performance and quality is what we expect from all our Opel cars,� says Hans Demant, Managing Director of Opel. 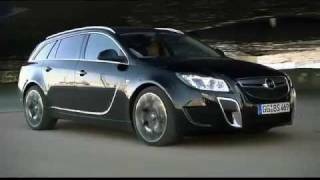 The Opel Insignia OPC Sports Tourer boasts a 325 hp/239 kW, 435 Nm 2.8-liter V6 Turbo engine for maximum power. It features high-tech elements, like a lower, reworked mechatronic chassis with FlexRide, an Adaptive 4x4 transmission with an electronic rear limited slip differential (eLSD) and purpose-built Brembo brakes � all complemented by spacious station wagon functionality with 1530 liters of load capacity. Like the Insignia OPC sedan, the Sports Tourer is full of technological highlights. The OPC engine is 25 percent more powerful than the 260 hp version of the 2.8 V6 Turbo in the Insignia Sport and Cosmo. The increase in power was obtained by reworking the exhaust, significantly reducing the counter pressure, with special mufflers contributing to a sporty, deep sound. The unit comes with a six-speed manual transmission, enabling acceleration from zero to 100 in 6.3 seconds and a top speed of 250 km/h (restricted). The management unit of the Adaptive 4x4 with eLSD has been recalibrated to adapt torque distribution to the sporty philosophy of the OPC. Engineers at the Opel Performance Center developed a specific high-performance front axle called HiPerStrut (High Performance Strut) for the chassis, which is 10 mm lower than the AWD Insignia Sport version. Benefits include reduced steering disturbances and an improved handling feel for the driver. The OPC's standard electronic FlexRide suspension has been adjusted for extra performance and caters to those enjoying a sportier ride. It offers three different sporty choices: The standard mode provides its most comfortable ride, a Sport mode is stiffer and a new OPC setting brings optimal fun. Before it hits the roads in the fall, the new Opel Insignia OPC Sports Tourer will take its turn against the Green Hell: 10,000 fast kilometers on the Nordschleife translates to around 180,000 kilometers on the road. Modified tuning accommodates the station wagon's shifted center of gravity, which is why the Sports Tourer suspension will be tested separately on the Ring. An Arden Blue Insignia OPC sedan completed its rite of passage earlier in May, confirming the high quality standard that Opel customers expect. The Insignia OPC Sports Tourer is the latest chapter in a long station wagon success story. As a pioneer in this segment, Opel brought the Olympia Rekord Car-A-Van, a combination of car and van, to Europe in 1953. In 1970 Opel built the Ascona Voyage, the first lifestyle station wagon. The next innovation in this segment followed in 1991, when Opel presented the most powerful production station wagon in the world, the Omega Caravan 24V, a 3-liter, straight-six cylinder with 204 hp. The Vectra OPC continued the Opel tradition of powerful station wagons. It was available from 2005, ultimately as a high-performance front-wheel drive model with 280 hp. The new 325 hp Opel Insignia OPC takes a huge step forward in terms of driving dynamics with even more power and the Adaptive 4x4 system. And the dynamic Sports Tourer version is also bound to turn heads. Opel testing on N�rburgring's Nordschleife has a long tradition dating back to the 1960s and sealed when the German brand signed a partner contract with the legendary race track in 2006. It was then that the R�sselsheim automaker opened its own test center directly at the Ring. The venue offers ideal testing conditions, particularly for Opel's OPC models. The current high-performance model portfolio includes the Corsa OPC, Astra OPC, Meriva OPC and Zafira OPC in addition to the Insignia OPC notchback, hatchback and Sports Tourer. While the special �N�rburgring Edition� model of the Astra OPC honors the demanding race track, the Astra �OPC Race Camp� pays tribute to the second season of a wildly successful race driver casting. The OPC Race Camp offer ambitious drivers with no motorsport experience the opportunity to discover their motor racing talents through a rigorous talent scouting process and numerous qualification stages. Those who have the necessary abilities then receive professional instruction to hone their skills and prepare them for competitive motor racing. Opel provides the professional training, cars and necessary organizational support for the Race Camp. Currently 750 candidates from a total of 22,000 applicants are undergoing the training and elimination process led by former race drivers and Opel brand ambassadors Manuel Reuter and Joachim Winkelhock. All hope to land one of the 10 coveted spots on the driver team for the two Astra racing cars that participate in the 24-hour race on the N�rburgring next year.